The WorldWide Telescope (WWT) is a Web 2.0 visualization software environment that enables your computer to function as a virtual telescope bringing together imagery from the best ground and space-based telescopes in the world for a seamless exploration of the universe. WorldWide Telescope is created with the Microsoft high performance Visual Experience Engine and allows seamless panning and zooming around the night sky, planets, and image environments. 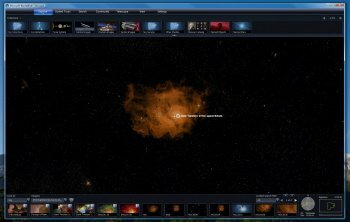 View the sky from multiple wavelenghts: See the x-ray view of the sky and zoom into bright radiation clouds, and then crossfade into the visible light view and discover the cloud remnants of a supernova explosion from a thousand years ago. Switch to the Hydrogen Alpha view to see the distribution and illumination of massive primordial hydrogen cloud structures lit up by the high energy radiation coming from nearby stars in the Milky Way. These are just two of many different ways to reveal the hidden structures in the universe with the WorldWide Telescope. Seamlessly pan and zoom from aerial views of the Moon and selected planets, as well as see their precise positions in the sky from any location on Earth and any time in the past or future with the Microsoft Visual Experience Engine. As a hobby astronomer and generally interested in physics and technology, this program is amazing. Nice tidy GUI, very user-friendly. I can use it simply for the sheer entertainment or for scientific research. It triggers the curiosity across numerous fields, so in education purposes this definitely would be a valuable tool! The throughout high image quality are highly impressive no matter where - or what - you are looking at! Microsoft is more and more stronger!I'm very happy that because I just buy a refracting telescope from the market. Why don't you - that's right - you, test this program and report back. Live up to your pseudonym and stop b****ing - stand for the community. To people with install problems (seems like it wants to install something else?) - had this too. Put the msi/download in it's own directory and install from there. Insane requirements -- a good graphics card, gobs of RAM, fast CPU. I give it the highest mark because when everything is working right, it is visually stunning, and blows everything else (Celestia, Google Sky, etc) out of the water. Now if we can only get them to release PhotoSynth for everyday joes to create their own collections, that would be something. I give it a three because of the massive system requirements. Works fine for me,very interesting app. much better than Celestia. Tons of info. If Astronomy is your thing get this program right away,it is worth it. OK D/Loaded to a different drive and it now loads. Tried again and I'm getting the same results Excel Comment Extract program. Am I doing something wrong? Crashed on Vista Ultimate x86 (SP1) without installing DX9.